Some people see them and many don’t – but they are there, the pythons, the cobras (spitting and otherwise), the green tree snakes, the garden snakes and all the in-between ones native to the tropics. I have a number of enduring stories – and recollections – which hold audiences rapt and disbelieving, all ophidian; sinuously compelling narratives (judging by reactions to the tales) spanning more than a decade; my various unsought, uninvited brushes with herpetology. There was the innocuous April afternoon, waiting by the gate for the school bus, a frisky four year old at hand. It was all sun and dappled shadow, green tracery as boughs met and intertwined overhead, an everywhere torpor – the absolute, utter quiet of things at rest; a voice, a laugh, words … travelling long distances to arrive as faraway counterpoints, the hum of the bee magnified, the rustle of leaf pleasantly scratchy. 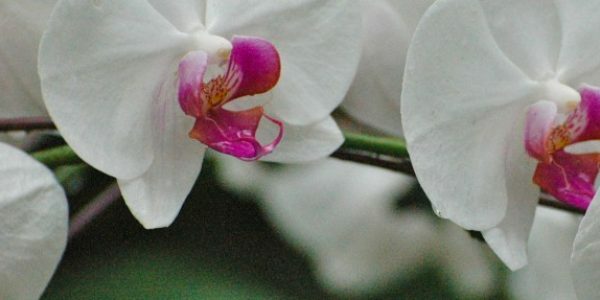 Near perfect, in short, till the somnolence was shattered by a mighty disturbance in the branches of a nearby rain tree, and a twisting mass of snake fell to the ground, writhing and thrashing. This was my first encounter with a serpent in Singapore and I did not have the faintest idea what kind of snake it was; all I remember is gathering my child up and running, fleeing. Of course, no one believed my story in entirety, but the guards in the Guard House were witnesses and it all happened exactly as I have written. 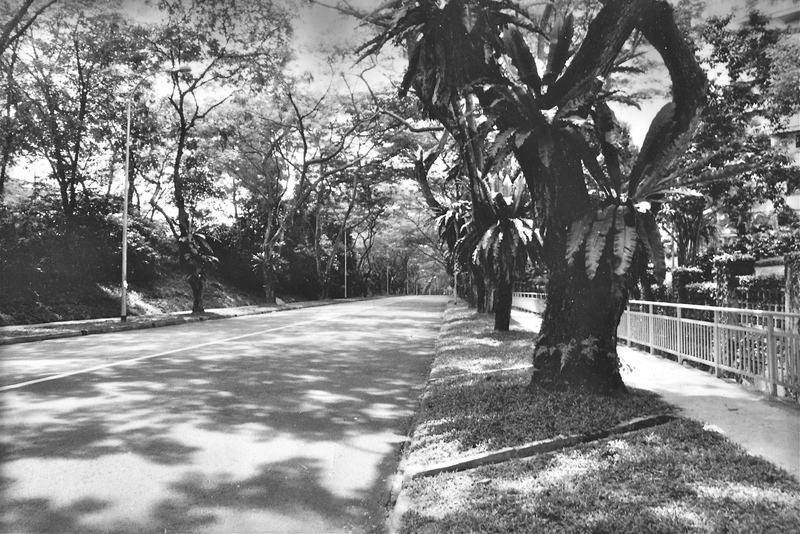 The numerous, daily walks down and around the same road, a Heritage Road, a tunnel of silver and green, offered endless possibilities of encountering a special kind of Singaporean roadkill – those hapless, ill-timed and misjudged slitherings flattened to thinly iridescent sheaths beneath the crushing rubber of a speeding automobile. Every perambulation was fraught with anticipation, charged with adventure, and invariably the dead snake was spotted just before one stepped on it … the nimble leap executed to avoid it almost always was ineffective, you landed right on top of it because you saw it just a fraction too late. An incurious observer on a balcony might idly wonder at this occasional high jump accompanied by some agitation and a high pitched squawk. It took a discerning taxi driver to comment on this intersection of possibility and circumstance, an impeccably suited man with wrap-around glasses and white gloves in an impeccably white Mercedes. You dare ah, you dare, wah you so brave what ? he said with some admiration. What, I enquired, was it that I dared to do ? Live here, he replied, adjusting his uber-reflective sunglasses, white gloved hands lightly spinning the wheel, here wah, so many snakes. You see ah ? Yes, I replied, sometimes I do. Wah, he continued, shaking his head in some wonder, you collect skin what, you make your own handbags ? And then there was the time when our help took our chocolate Labrador down for a quick walk by the Ulu Pandan Park Connector, just off Ulu Pandan road. She returned flushed and breathless. Black cobra Ma’am, she exclaimed, in the grass. It stand up and hiss. Our dog, he say woof woof and snake go away. A few weeks later, along the same Ulu Pandan Connector, I encountered my first python. It was by the walking track; trees and green sward to my right, a railing to my left, protection from the concrete drain that fell deeply downwards and outwards. It was 7 a.m. in the morning, joggers, strollers, cyclists, people going to work and children going to school, cleaners raking up leaves, dogs on chains and babies in prams. Lost in the music of the iPod, I walked into the outstretched arm of the jogger in front of me. He had stopped, as had a group of people on the other side, about five feet from us. 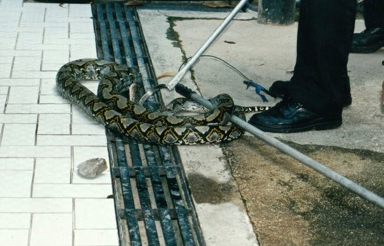 A reticulated python was coiled around the railing, to our left, having come up from the drain, waiting to access the greenery on the other side. People halted and grouped. The reptile judged its moment, unhurriedly uncoiled itself and crossed over in an endless glide, disappearing into the dense grass before it reappeared, making its way up a tree trunk into the branches. And people resumed walking and jogging and cleaning. Post that incident, the need to judge the perfect centre line of that narrow path – where you didn’t walk under a tree (and a python) or brush up against the railing (and a python) – remained as a niggling sense of unease. On another occasion, some desultory morning excitement, when a brown snake was discovered (motionless) in the garden. Our help shivered and trembled while I called Pest Control. $ 150.00 plus 12% tax to remove it, they said, $ 250.00 ++ if it was a cobra and $ 120 ++ if we come and cannot find it. They came in two vans, nine of them, and were done in a tick, grinning and dangling a ‘small, brown, common, non-poisonous house snake‘ by its tail. We squealed, shivered and shrieked enough to satisfy their uniformed masculinity and they gave me a paper to sign, which said, Inspected, Caught and Cleared one snake in basement garden. We were blasé with the next motionless snake found a couple of months later, beside the car, the Straits Times on the tiles beside it. Our cat, said our help, she done it. Should I clear it, I offered, and she shrugged nonchalantly, no I can do it. It was grist to her mill now. My last story is a big one, as big as the twelve foot python, which was sniffed out by our dog as it glided along the garden wall, seeking egress. We watched entranced and repulsed as the massive, muscular creature undulated its way along the periphery of brick and stone. The gardening crew, luckily at hand, trapped and bagged it. (It is against the law in Singapore to kill a python because it is non-venomous; pythons are captured and released in the wild). One of the gardening crew came from around the side of the house, with a bundle in his arms and the flat statement your cat is dead. It wasn’t our cat, it was the glossy, beautiful black and white from next door, serene in death, despite its strangulation. The neighbor was informed and she wept as she cradled her pet to her bosom. We brewed some coffee and discussed how her children could achieve closure. Our cat, meanwhile, had disappeared and we were quite sure she had fallen victim to the serpent as well, but no, she had taken refuge in a house three doors away and had to be coaxed home with assurances of protection and safety. What do you do if you find a snake in your garden or patio or garage ? You can call 999 (Police) and they will assess the situation. Alternatively, call your Pest Control agency; and if you live in a ‘sulphur’ house, be sure to include ‘snakes’ in your annual contract. 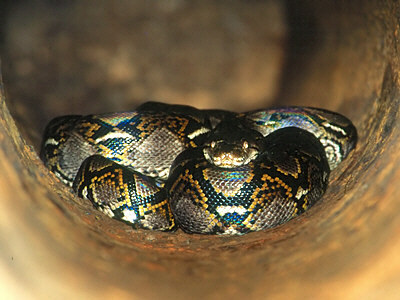 (‘Sulphur’ homes are ones with lots of greenery – and therefore, the possibility of visiting snakes. Pest Control agencies sprinkle sulphur along the perimeter of the garden as the chemical odor repels the creatures). Click here for more information. My python story was retold endlessly and breathlessly, though there were (unfounded) suspicions that the size of the snake increased with each re-telling. What I remember most clearly though, was the reaction from a friend. After my call, I got an email, almost immediately, with photographs of the python that visited her home and the question in italic, bold Is your python bigger than mine ? Photographs from these sources : ecologyasia.com (the python) and the Raj family (for their python picture). Other pictures by Anita Thomas.